Yes, it is time to get our kids back on a school schedule. This article is a reminder for some, and a very important checklist for the new single parent. 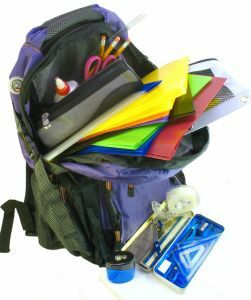 I have gathered a lot of suggestions from our SingleDad.com members who wanted to share their tips for getting prepared for the school year. Keeping an inventory of clothes between divorced parent’s households has its own unique challenges. Depending on the relationship status, it is perfectly normal to label your child’s clothes for the sake of inventory exchange. I would strongly recommend disclosing your reason for marking the clothes. Your goal is to make every effort to keep an open dialog. Offering a bi-weekly clothes exchange will help keep both household’s clothes inventory balanced and communication between all parties peaceful. Make sure your markings are distinct to you, but not embarrassing to your child. Depending on where you live and the late summer/early fall weather, it is smart to wait to buy school clothes after the school year starts. Most department stores and clothes retailers will offer additional discounts on school clothes after the school year has started. If you don’t mind a smaller selection of styles and sizes, waiting can pay off big with your wallet. In addition, keeping an eye on some of the discount stores such as Ross, Marshalls and TJ Max can also save you money. If you don’t mind sorting through the selection, I have found these stores can offer some huge savings on quality clothes at less than half the department store price. Another concept that has been gaining popularity is called a clothes exchange. These are organized events that your local church or a community group will sponsor. It is like a clothes-only garage sale. Most of the time no money is required, you just bring your kid’s clothes to offer in exchange. Finally, the thrift store has become the new “cool” place to exchange clothes. Check your local thrift stores to see if they will offer you exchange credits for clothes that you bring in that you can use to pay for new clothes from the shop. The best advice our members can offer on this subject is to start early. You do not want to attempt to get your kids started on a proper sleep schedule the night before school starts. There is nothing worse than hearing about the whining, complaining and lack of attention that will happen at school from the lack of sleep. Furthermore, it is embarrassing to attending your first parent/teacher meeting and having the entire discussion about your child’s well being. Sleep is as important as food and water. If you are newly divorced, make sure you and your ex set a time for your child’s bedtime. It is recommended that your child gets 8 to 10 hours of sleep a night. For a variety of reasons, some single parents do not have the participation of the other parent in child’s daily school life. This is where it is especially important to have your emergency contact available and shared with another family member, friend, or relative. I have a “Gal Pals / Guy Pals” in place which are other friends of mine that I can rely on as back up for any emergency related to my children and school activities. Make sure your emergency contact has a copy of your health insurance information, family doctor’s name and phone number. Another important tip is to save this information on your cell phone but make sure this information is typed in backwards so the information will be harder to understand by anyone else but you if you ever lose the phone. At the beginning of every school year, your child’s school will ask for all of your personal information and it is perfectly normal and important to disclose on the information packet that you are a single parent and if you are sharing custody or have sole custody. Make sure your school knows your status and how they can contact you. Don’t make assumptions; make sure your child’s teacher has your contact information as well. It is also perfectly normal to request a teacher’s contact information like an email address. This information gives you the opportunity to send an e-mail with all of your contact information directly to your teacher and gives both parties a direct method of communication. This is especially important if you are co-parenting. Staying up-to-date on homework and school activities through e-mail avoids any miscommunication between parties. Richard “RJ” Jaramillo is the Founder and President of SingleDad.com. With over nine years of experience helping other single parents with advice, support, and resources; RJ is excited to share his company and personal mission on teaching others how to “Make Life Happen…Again!